We will create a custom design for you based on one of the fixed layout options available for this package. We will supply a shop home page with a matching item listing design. 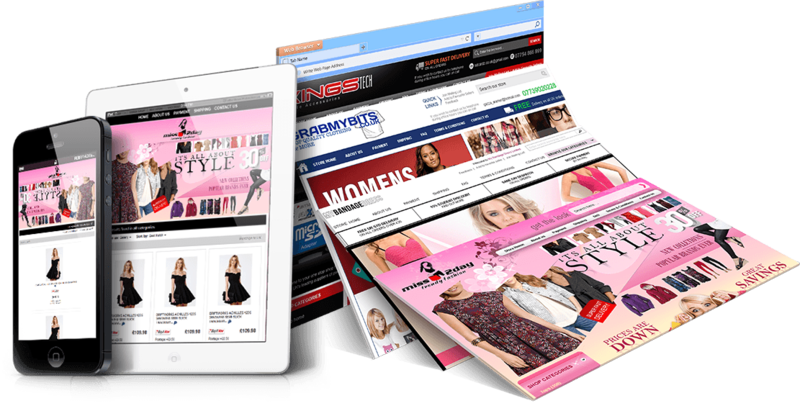 Your design includes a customized store header with logo, contact information and search box. eBay Store page links will be incorporated into your header design. The custom designed store category list displayed on the left side of the shop and item listing helps to speed up navigation through your store and encourages buyers to remain in your store rather than return to eBay’s general search. These categories are based on the categories you created within your eBay shop setup. Dynamic navigation means that when you add or delete Store Categories in eBay they will automatically appear or disappear from your navigation. Graphics are included for one or two promotion boxes (depending on the selected layout) which appear in both the shop and item listings. Use them to advertise the things you consider to be important in your business – free shipping, special offers etc. All of our designs will include full mobile responsive coding to allow you to take advantage of the rapidly increasing number of buyers accessing the internet via mobile devices. These designs make browsing and buying a hassle free experience for mobile users. Payment can be split into two (2) equal instalments, subject to agreement.